Hint: It's not a request to increase the chocolate glaze on my favorite doughnut. Dunkin' Brands Group (NASDAQ:DNKN) has entered 2019 in reasonably good shape, as the company's shares managed to finish flat last year, avoiding the share price losses of many of its publicly traded competitors. Prospects are generally bright for the doughnut and beverage giant, as management expects current-year sales to be enhanced by a 2018 year-end upgrade of the company's coffee offerings. But what's a new year in the equities markets without a little armchair criticism from detached observers? 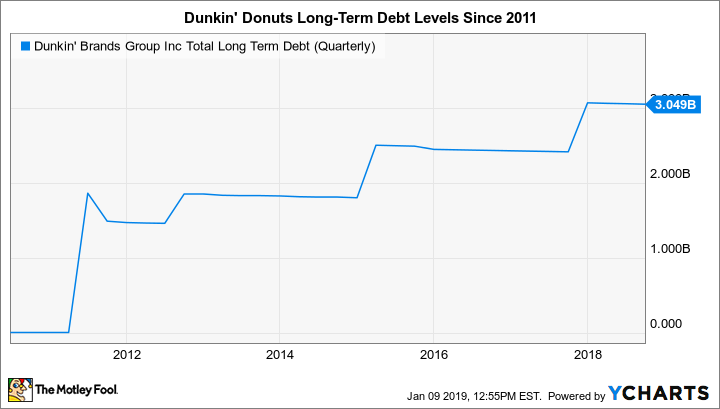 If I could choose one item to harp on in 2019 -- and I suppose I just did -- it would be Dunkin' Brands' capital structure, which is weighted too heavily toward debt for my liking. Those who hold shares of DNKN are probably already aware that the Dunkin' financial model allows for copious amounts of debt on its balance sheet. Since going public in 2011, the company has used regular debt offerings to raise cash, which is then returned to shareholders via share repurchases. These repurchases typically occur when Dunkin' refinances its debt. Management tends to utilize borrowing power created by increased earnings to offer new debt in excess of required refinancing levels. This was the case in the company's latest major refinancing in November 2017. Dunkin' issued $1.4 billion of senior fixed-rate notes and used part of the proceeds to retire $731.3 million in older notes, while returning $650 million to investors in February 2018 via share repurchases. This debt-financed share repurchase activity fits within the Dunkin' corporate philosophy and business model. Dunkin' Brands operates as a nearly 100% franchised operation -- it runs very few of its own locations. Due to its stable cash flows from the collection of regular royalty and franchise fee payments from its franchisees, Dunkin' purposefully leverages to the hilt. Shareholders are generally supportive since they are the indirect recipients of the excess cash. DNKN Total Long Term Debt (Quarterly) data by YCharts. Now, this high-leverage, shareholder-return-focused model is actually quite common in the quick-service industry among completely franchised operations. Yet Dunkin' tends to maintain a higher debt balance relative to earnings (in the form of EBITDA) versus its peers. The company's debt-to-EBITDA ratio as of its most recent balance sheet date (Sept. 28, 2018) is 6.9. This means that its debt load is roughly seven times a single year's adjusted earnings. That's a lofty number. For comparison, McDonald's sports a current debt-to-EBITDA calculation of 3.1. And Burger King parent Restaurant Brands International, which is typically cited as a poster child for this model, has a current reading of 5.9. Dunkin' itself presents a "net debt to adjusted EBITDA" ratio for shareholders to consider. This means that it subtracts unrestricted cash on hand from debt, and removes certain items from EBITDA to arrive at what it believes to be a truer representation of earnings. But using this calculation yields a ratio of 5.2 -- for an adjusted number, that's still extremely steep. I hope I've anticipated your logical question: Should such steep borrowing be an issue at all? Dunkin' is able to service its debt with currently generated cash flow. And the rationale for additional leverage -- to mount significant share repurchases -- is often cited as a tool that companies can use to support their share price. This may be true enough on days when a corporation is participating in the open market and engaged in buyback operations. And theoretically, on a longer-term horizon, reducing a company's outstanding share count may also support the stock price, since fewer shares will be available for purchase when demand rises, thus pushing up a stock's asking price. Of course, it's difficult to empirically prove the extent of this supply/demand dynamic, since so many factors influence a stock's pricing at any moment in time. And if you subscribe to this theory of long-term support for a stock's price due to reduced share float, the opposite should also be true. That is, when investors are in a "sell" mode, downward pressure on a company's share price can be exacerbated, as fewer shareholders make for a less-liquid market for shares. I'll close with an extremely simple reason to back off the borrowing binge: Higher debt ultimately cuts into net income. The company's interest expense has increased by 31% through the first three reported quarters of 2018 due to the October 2017 refinancing. Interest expense in this period of $97 million equaled roughly 30% of total operating income of $315.3 million. Now, it's true that the spike in interest expense didn't hurt Dunkin' Brands' bottom line in this period, thanks to a nearly 50% reduction in income tax expense as a result of the year-end 2017 U.S. tax legislation. The reduction of nearly $44 million in income tax expense more than absorbed the impact of higher interest. Still, to me, elevated interest expense seems like a needless tax on earnings, which especially punishes new shareholders who are buying the DNKN symbol today, and won't receive a tangible benefit from past share repurchases. In 2019, I'd like to see the Dunkin' leverage trend, and its associated interest expense, change direction for once. Check out the latest Dunkin Brands earnings call transcript.